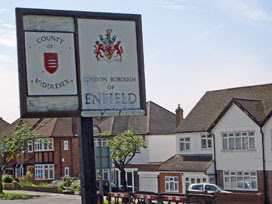 As the Piccadilly line crept northwards in the early 1930s, so the tendrils of semi-detached suburbia pushed out into the fields between Barnet and Enfield. A delightful location, therefore, for an architectural stroll. The Museum of Domestic Design & Architecture has published three pocket-sized mini-booklets detailing guided walks in the area, each starting and finishing at a classic tube station. So I bought the set from the shop at their museum in Cockfosters (£1.99 each, or £5 for three) and set off to rediscover suburban bliss. Some would argue that there's no finer tube station than Arnos Grove . Charles Holden's drum-like ticket hall rises with pleasing lofty symmetry, very much a child of the Art Deco 30s, and perfectly in tune with the surrounding suburbs. These are no identikit homes, these are proper little domestic palaces in a variety of architectural styles. Booklet in hand, I headed off along the designated trail. Within a couple of minutes I'd admired a Grade II listed swimming pool, a geometric-framed library and a neo-Tudor pub, all of which I might easily otherwise have ignored. Down into Arnos Park - a reminder that not all these former fields ended up beneath houses and gardens - and up the other side into residential Arcadia. Morton Way, and the avenues leading off from it, are quintessential suburbia. Well-spaced gabled semis, set back from grassy verges behind manicured privet hedges. 75-year-old trees with lopped-back branches, shadowing conservatory extensions and set-apart garages. Herringbone brickwork and diamond-lattice windows, brightened by the occasional intricate leaded light. Steep tiled roofs topped with obsolete chimneypots, shielding over-prominent burglar alarms. And so much larger than any London developer would build today. You could get at least four flats out of the floorspace taken up by one semi-detached home, and probably a block of 20 if you threw in the back garden too. In Whitehouse Way are a few contrasting clusters of flat-roofed modernist semis, noted by Pevsner, each pair with gently curving frontage. My printed guide helped me to identify the shiny pigmented blocks surrounding certain doorways as Vitrolite (alas no longer made, should you want some for your own residence). Onward up Summit Way to the heights of Southgate. It was striking how few of these houses still have a green front garden. Where once were lawns and flowerbeds, the only variety these days is whether the crazy paving is rectangular or irregular, and which car has been parked on top of it. Homeowners' horticultural skills, out front at least, are restricted to a few tiny strips of earth dotted with the occasional shrub or rosebush. On a midweek morning, these residential streets were a hive of middle class activity. The postman was delivering a package to number 48, watched from the end of the garden by a padding tabby. Further up the road a vanful of builders were attempting to look busy, while nextdoor's windows were receiving vigorous attention from a window cleaner perched up a long ladder. Meanwhile the lady of one house was scrubbing down her front porch with purple cleaning fluid, a flash of bright red stair carpet visible in the hallway behind her. I received a polite "good morning" from a permed pensioner walking down the hill trailing a tartan basket on wheels. If only I'd seen a milkfloat humming by, the suburban illusion would have been complete. It's not all semis. There was a luxurious stack of cottage-y flats at Bush Court, round the back of Chase Side, perfect for the newly-relocated 30s commuter. And then there was Southgate station, of a similar age, and even more outlandish . It looked like a flying saucer had landed, or maybe some engineer had built a translucent electricity substation in the wrong place. Surrounding half of the squat circular building was the austere brick crescent of Station Parade. A large clock ticked silently at the centre of a sheer brick curve, beneath which were tiny unbranded shops named only by retail category - "JEWELLER" "ARTS AND CRAFTS" "TAKE AWAY FOOD" "FRIED CHICKEN SHOP". The whole area may now be three quarters of a century old, but it has a coherent modernist appeal that vanquishes anything truly modern. Walk 2: Southgate to Oakwood. More of the same, but with allotments. Walk 3: Oakwood to Cockfosters. More of the same, but with contrasting council houses. This walk also passes the Museum of Domestic Design and Architecture, on the campus at Middlesex University, which you still haven't visited yet, have you? Their Shell Guides exhibition runs until November, so don't delay too long. Now this is a brilliant idea. You head to East London. You collect a free black box receiver from a local museum or library. You plug in some headphones (provided). And then you go for a walk along a prescribed three mile route. Listen carefully, because 20 audio transmitters have been attached to various lampposts and buildings along the way. As you approach, these broadcast a series of memories and reminiscences from the people who used to live here. All the broadcasts are looped, so you can listen to as much or as little as you like. And by the time you get to the end of the walk you should have a much better understanding of what life here used to be like. It's called Linked, and it's a brilliant idea. What's less brilliant is that the idea was needed in the first place. 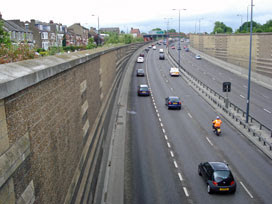 It was obvious, from the 1960s onwards, that a relief road was needed between the foot of the M11 and the Blackwall Tunnel Approach Road. Traffic often queued up through Wanstead, Leytonstone and Leyton, and the problem grew worse with every passing decade. So a link road was planned - a dual carriageway carving through the heart of east London - in an attempt to ease the pressure. But this six-lane highway required the demolition of 400 homes, the evacuation of hundreds of families and the sacrifice of a random linear neighbourhood. As local residents moved out the protesters moved in, and an intense long-term battle with the developers ensued. Many fiendish means of resistance were used to delay the inevitable, but the authorities (of course) eventually won. The new link road opened as the A12 in 1999, and traffic delays have been much reduced ever since. But of the communities that used to thrive here, only memories remain. I think I looked a bit of a wally standing in the middle of a Wanstead footbridge wearing my municipal-issue headphones. I was trying desperately hard to listen to the first set of recorded voices, but struggling to hear anything coherent above the roar of the traffic below. Something about Anderson shelters, I thought, but there was no volume control on my little black box so it was impossible to tell. Ditto at the next transmitter (something unintelligible about a golf club, I think). Suddenly an audio artwork located along the edge of a busy main road didn't seem a terribly sensible idea after all. But on the far side of George Green, beneath a cylindrical transmitter, I finally latched on to the full impact of the piece. Protesters (including Jean the lollipop lady) recounted their fight for the 250-year-old sweet chestnut that used to stand here. Some chained themselves to the tree, some lived in a treehouse in the branches, while Jean was sacked from her job merely for encouraging others to surround it. Her audio ramblings brought a sense of pathos to the tree's ultimate destruction. The new link road soon carved through central Wanstead in a cut and cover tunnel, and the spot where the chestnut once stood is now part of an illusory platform of grass whose depth is clearly insufficient to support roots. On to Leytonstone, learning along the way of demolished houses and long gone drill halls. I thought there'd be more transmitters along this stretch - maybe I missed some - but the installation didn't really spring to life until closer to the tube station. I wonder what people thought I was doing, hanging around beneath unwelcoming footbridges and lurking on drizzly street corners. I couldn't move too far or the transmissions would fade away, so my loitering must have looked very suspicious. Few local residents realise that this artwork even exists - indeed the library I visited had only hired out two other receivers since Easter. The most evocative radio messages came at the Leyton end of the walk. 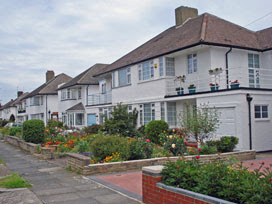 The strongest resistance to the new dual carriageway erupted in Claremont Road, an ordinary terrace of ordinary houses running parallel to the Central line. Protesters moved in before compulsory purchase orders could be served, and filled the street with abandoned vehicles and immovable 'sculptures'. A community of resistance fighters was established, holding out longer than any other until eventually removed kicking and screaming from a final stronghold on the rooftops. The Linked transmitter chooses to tell the story of an earlier resident, remembering happier days before the agonies of moving out. 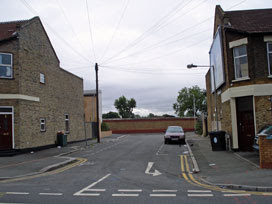 The tale is all the sadder because Claremont Road (see photo) has now been reduced to a mere stump, with no houses of its own, ending abruptly at a brick barrier. There's no longer a community behind the wall, just the perpetual hum of traffic rumbling by. Standing listening to the past in a short cul-de-sac of parking bays really brought home the car's crushing victory. Few people may be listening, but these transmitters continue to pump out memories of the past all day every day. The gardens described along Grove Green Road still exist electromagnetically, even though the tulips, barbecues and wallflowers have long been wrenched away. The violent acts of the evicting bailiffs, revelling in unnecessary destruction, are still witnessed once every five minutes above Colville Road. And drivers speeding happily along the A12 may not hear it on their radios, but this gaping tarmac chasm is permanently flooded by echoes of what was here before. Indeed, as one protagonist still repeatedly declares, "The house exists in my brain, the community exists in my heart." Do one day get hold of a receiver and bear witness yourself. According to the Walk London website, tomorrow is National Walking Day. I'm not sure I believe a them, because no other website backs up their claim. But they're celebrating this weekend by running 37 guided walks across London, each following a different part of one of the capital's strategic walks. And I'm celebrating by going for three completely different walks, for three consecutive days, and then writing about them. They're three very contrasting walks, each in some way official, and in completely different parts of London. Starting today with a stroll along a river you may never have heard of. The Beverley Brook rises on the southwest edge of London, sort of Worcester Park-ish, and flows to the River Thames at Putney. It's not much of a river, often little more than a concrete culvert, but it drains 64 square kilometres of the capital. And some it is really very pretty. Not so the first stretch of the official Beverley Brook Walk. Up the High Street from New Malden station, across a golf course to the A3, then threading a few suburban avenues. Come on, where's this river? Ah, that's better. From the grounds of the local rugby club, the Beverley Brook runs up the western edge of Wimbledon Common. You're probably thinking open heathland and Wombles, but this corner of the famous common is all woodland. And extremely quiet. The river wiggles northward at the bottom of a deep earth channel, occasionally ruffled by a mandarin duck or a paddling dog. Onward beneath thick trees for almost a mile, with cyclists banned and horse-riders diverted elsewhere. If only the brook didn't have low concrete edges, this really would be quite delightful. The A3 intrudes again, forcing a detour over a high footbridge (for the walk, obviously, not the river). And then, through the Robin Hood Gate, straight into the giant green lung of Richmond Park. Mind the horse manure, and the bikes, and the kids scrabbling for an ice cream. The river's a little wider here, heading up the eastern side of the park parallel to the road for about a mile. And, if you walk unobtrusively enough, you might be lucky enough to find yourself right up close to one of the park's herds of deer. At this time of year it pays to be cautious of overprotective mothers, but I managed to get surprisingly close to a young buck skipping down the bank to drink fron the stream. Highlight of the walk, that. Exit via the Roehampton Gate, and up a narrow alley to the edge of some more playing fields. That's the last you'll see of the river for a while. 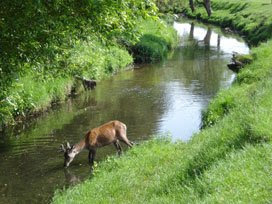 Time to safari through suburbia while the brook flows onwards mostly out of sight. There's a brief glimpse at Priest's Bridge (more a street name than a feature), then a double level crossing to negotiate on the way to Barnes Common. Finally, after an eerie trek through an abandoned cemetery, a footbridge brings you back to the water's edge. This is all very pleasant. But just two more bends and the journey is at an end. Suddenly, really very unexpectedly, the Beverley Brook opens out into a small basin and dribbles into the Thames. The contrast in size and breadth is instant and extreme. That's Craven Cottage almost immediately opposite, and the many boathouses of Putney stretching out to your right. Take your pick how you depart - the official walk is at an end. Chinatown in Soho is all very well, but there's a far more genuine East Asian dining experience a few miles up the A5 in deepest Colindale. It's called Oriental City, and it's an unexpected eastern treasure. Alas, it's also doomed. This Sunday evening, at 7pm precisely, the dim sum will stop, the diners will be ejected and the doors will be permanently locked. And all because what this part of London really needs, apparently, is eight blocks of flats, a health and fitness studio and a B&Q. It's a damned shame. From the outside, on the Edgware Road, Oriental City looks like a rather shabby grey warehouse. The garden frontage is threadbare and overgrown, guarded over by a handful of gruff marble dragons. A row of blue canopies give the place a slightly, but not especially, eastern flavour. Various letters have fallen off the wall and not been replaced (ORIENAL) (RIENTAL). And yes, that's Sonic the Hedgehog, attempting to entice passing 90s youth into the "Sega Park" within. Please, don't let any of it put you off venturing inside. Most shopping malls have a Food Court, but here it's Oriental City's finest feature. A choice of freshly-cooked cuisine, be it Thai, Korean, Vietnamese, Malaysian, Indian or Chinese. Colourful pictorial menus, brought to life on sizzling grills or spinning spits. A large central space to sit down with friends or family beneath dangling orange balloons, waiting for your order number to appear on the electronic displays. And happy feasting punters, chopsticks poised, perched on plastic chairs at wood-effect tables. There were still a few spare seats yesterday afternoon, but I bet this place will be packed out by the weekend. Hidden behind the Food Court there's a rather austere Japanese supermarket, much larger than you might expect, but whose shelves are now running down in readiness for closure. Elsewhere, in several small retail units around the site, simultaneous Closing Down sales are underway. 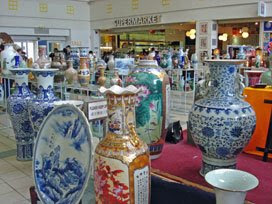 There's 80% off giant porcelain vases, 3 for 1 on Japanese lifestyle goods, and a pile of cut price handbags to be fought over. If you've ever wanted cheap plastic flip flops, half price pastel crockery or a special silky kimono, now is the time. And up the semi-functional escalators, level with the top of the car park, they're serving the final meals in the China City restaurant. It's a crying shame. 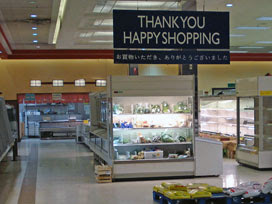 Some of the retailers have hand-written or printed signs to inform loyal customers that they're relocating elsewhere. The supermarket's off to Queensway, for example, while the Hamazaki Bakery is moving to Whetstone. For other businesses, however, the notices have a more melancholy undertone. "Our last day will be 1st June 2008 and we will be taking orders until 6:30pm. We have not found our own premises yet but please leave your email or mobile number so we can update you." There may be plans to incorporate an oriental marketplace in the new development, but that's several years from completion and many of these family-run businesses will never survive an enforced hiatus. I can't believe that Oriental City's "revitalised" replacement will ever have the character and genuine charm of the original. Not being a fan of dim sum, duck and dumplings (as some of you can attest) I didn't stop for a final meal in the condemned Food Court. But I did pause at the Wonderful Patisserie (only the Chinese could get away with a name like that) on my way out. Their sugary fruit-topped cakes looked mighty tempting, but alas unwise, so I made do with a box of Fortune Cookies. No, hang on, the girl behind the counter insisted that they were now 2 boxes for 75% of the price of 1, and who was I to argue? I've got one of the cookies here now, so let's see if its contents offer any insight into the complex's future... "The heart is wiser than the intellect." The heart is certainly wiser than Brent Borough Council's planning committee. Cardiac arrest in four days, and counting. A new bus to link Canary Wharf to the City. It's amazing there hasn't been one before. So they launched it on a Saturday on a bank holiday weekend, presumably to give the drivers three days to get the hang of the route before the passengers turned up. Everything should be working fine by Tuesday. I stood for nearly half an hour outside the Asda superstore on the Isle of Dogs, waiting for a 135 to whisk me away. Lots of 135s arrived and proceeded to circle the car park, but none ready for the beleaguered shoppers of E14 to board. Most of Asda's bus-bound customers were either old or obese, struggling from the entrance laden with carrier bags filled with toilet rolls or pushing a tartan trolley piled high with 3 for 2 tins. Not all of Docklands goes to Waitrose. Time passed. A 135 stopped by the bus stop so that an inspector could push a rubber strip back beneath the door-opening mechanism. They're brand new these buses, which is why the vehicle I eventually boarded smelt like fresh rubber rather than sweat and chips. And straight into a stretch of roadworks, and off on diversion. The 135 will normally be scheduled to run round half of the Isle of Dogs, but my bus managed to tour the lot. All the way round the Thames loop from top right to top left, with barely a river view in sight. Passengers waiting in Manchester Road were perplexed. Not only was our 135 an unknown quantity, it wasn't supposed to be passing their stop anyway. The on-board audio description service also failed to cope with the change of route. Rather than announcing the next stop, a disembodied female voice repeatedly declared <This bus terminates here> until, thankfully, the driver switched her off. An aside: Is it just me, or does anybody else find these "route-related service information" announcements really annoying? <135... to... Old Street> I don't mind being told what the next stop is, that's rather useful. <West India Avenue> But I am pig sick of being told, every single time the bus stops, what number it is <135... to... Old Street> and where it's going. <135... to... Old Street> Yes, I know it's a bloody 135 to Old Street, I wouldn't have got on board otherwise. <135... to... Old Street> Shut up! Some of these audio systems even operate in persistent nagging mode, repeating a limited repertoire of nannying announcements inbetween every stop. <Please take all litter with you when you exit the bus> <If you see an unattended bag, please tell the driver> <Closed circuit television is in operation on this bus> <Vandalism on London buses is a criminal offence> <135... to... Old Street> And TfL think this is a good thing? I am increasingly tired of being treated like an ignorant criminal every time I travel. <135... to... Old Street> Please, somebody make it stop. The first part of my 135 journey was a mind-numbing waste of time. It's only half a mile, direct, from Crossharbour to Canada Square, but we took 20 minutes via the indirect not-quite scenic route. It would have been far quicker to walk. Even threading between the gleaming towers at Canary Wharf seemed to take forever, not helped by having to pause at jobsworth security barriers while private vehicles ahead of us were lightly scrutinised. Only when we escaped out onto the Commercial Road did our progress finally quicken. In Limehouse I spotted someone I'd always believed existed but had never previously seen - the Bus Stop Route Number Updater. He was a cropped tanned bloke with a fag in his mouth, sitting in the back of a scruffy truck by the roadside. In his lap was the "Exmouth Estate" bus stop information board, and in his left hand a plastic bag full of fresh shiny "135" tiles. As I watched he shuffled the existing numbers around, a bit like one of those 4×4 plastic puzzles you find inside crackers, until the top row read "15 115 135". Jackpot. His handiwork can now be seen at bus stops all along the route - each with one gleaming new tile amongst a stack of weatherbeaten old squares. And so to the City, whose highrise ostentation came in sharp contrast to the mean streets of Shadwell. Beneath the iconic Gherkin, round a gaping hole which will one day support 36 floors of world class office space, and past the fresh-spiked peak of the Broadgate Tower. What with Docklands earlier, TfL could market this bus to hard-pushed tourists as "the skyscraper tour". Or maybe not. There wasn't much towering above the end of the route, skirting the edge of Shoreditch to pull up outside Old Street station. Unsuprisingly, I don't believe that any of those Asda shoppers followed me this far. I think the voting epicentre has moved even further east this year. Maybe even into the corner that's not actually Europe. Victorian engineering was often something special. Those top-hatted inventors were always exercising their grey cells, attempting to conjure up something mechanical and fantastical. Tower Bridge for example, or the Brooklyn Bridge, its contemporary counterpart in New York. Believe it or not, there were once plans to link these two bridges via a strange brass "visual amplifier" named a Telectroscope. 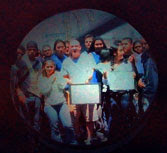 No actual physical travel was to be possible, just a projected image propagated along a deep subterranean tunnel. London would be able to look at New York, and New York would be able to look back at London. Now, at long last, one intercontinental Telectroscope has finally been built, emerging this week down beside the Thames at City Hall. Fancy a look? This amazing invention resembles a giant steampunk telescope half-sunk into the piazza. At the Tower Bridge end is a circular glass screen, beyond which a long dark tube curves and bends into inky blackness beneath the earth. A variety of shiny valves and dials control the transmission, each no doubt essential to the design. As for what happens down the tunnel between here and New York, heaven only knows. There's the odd clue on the inventor's descendant's website, but I rather hope it's all done with mirrors. Roll up, roll up. It only costs a quid to enter the Telectroscope's outer enclosure (although, grrr, New Yorkers don't have to pay a cent). You hand over your coin to the automated seller in the glass booth by the entrance, and he signs your souvenir ticket with an invisible signature before depositing it in front of you. Next, walk along to the screen and join the small crowd peering into Manhattan. There it is, that small distant circle projected deep inside the machine. That crowd you're staring at is 3500 miles away, and they're staring 3500 miles back at you. Wave now! It's fascinating watching to see what two distant groups of strangers do in this situation. Their only possible connection is visual, but some still choose to shout unheard words of greeting. Both sides have a small whiteboard on which short messages can be scribbled, although the pens have pretty feeble nibs so it's very hard to read what the other half are saying. But not impossible. "Hello from New York!" "It's very sunny here!" "Blow us a kiss!" Big smiles! What not enough people appear to be doing is to put the marker pen down, lower their camera and actually interact with their transcontinental counterparts. This should be long distance mime, it should be animated two-way audience participation. But it'll probably just end up as a few Flickr photos and forty seconds uploaded to Youtube. You have three weeks to get yourself down to City Hall (or, indeed, the Fulton Ferry Landing) and enjoy the transatlantic Telectroscope experience. The enclosure is open 24 hours a day, allegedly, which will keep the supervising staff on their toes. Be warned, if it's busy they'll only let visitors stand and stare for five minutes max. I was lucky after work yesterday, the queues were almost non existent. But I suspect that word of mouth will spread fast, a bit like the Sultan's Elephant a couple of years ago, so pick your moment carefully. Brooklyn sunset will probably be particularly quiet at our end. From tomorrow, the lowest number not used by a London bus route won't be 135, it'll be 218. From tomorrow TfL are introducing a new bus route between Canary Wharf and the City, and they're numbering it 135. This numerical choice makes good sense, it's the lowest number currently available, and this is likely to be an important route. How often have you found yourself outside Old Street station and suddenly wanted to take the bus to the Asda superstore at Crossharbour? Well, from tomorrow, you can. The new 135 also calls in at Liverpool Street, Commercial Road and Limehouse, so you can imagine just how useful it will be. With "135" imminently taken, that'll be every single number from 1 to 200 used. Or indeed every number from 1 to 217. But not 218. There is no number 218 bus in London. Which, from tomorrow, makes 218 the lowest number not to be used by a London bus route. You never know, this random factoid might come up in a pub quiz one day, and then you'll be grateful. But there was once a London bus route numbered 218. It ran for many decades between Kingston and Staines, out on the Surrey fringes. This was, incidentally, the last bus route in London to be operated by the classic red RF bus. [This fact probably won't come up in a pub quiz, sorry] And then, back in 1986, the 218 was transferred from London Buses to Surrey County Council. The 218 still runs today, once an hour (Sundays excepted), but it's run by Surrey and not by Boris so it doesn't count. London's lowest unused bus route number, as of tomorrow, will be 218. Tomorrow, what will be the lowest number* not used by a London bus route? 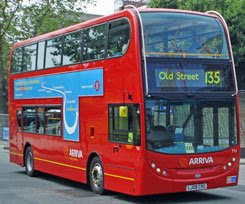 The lowest number not used by a London bus route is 135. There is, currently, no number 135 bus trundling around the streets of the capital. There's a 1, and a 2, and a 3, and every other number up to a 134, but there isn't a 135. There is a 135 in Manchester (it's bendy), there's even a 135 in Sydney (in Manly), but there isn't a 135 in London. There used to be a 135 here, though. London's last 135 ran between Archway and Marble Arch (ooh, very arch-y) between 1987 and 2000, after which it was withdrawn and replaced by other services. And there used to be a different 135 before that, shuttling around the Enfield area, but that was withdrawn in 1981. So there's no 135 in London today. A couple of years ago the lowest unused London bus number wasn't 135, it was 129. The original 129 ran for decades out Ilford way, but this service came to a premature end in 2004 when the 128 took over instead. So "129" was going spare in 2006 when TfL needed a number for a brand new route in Greenwich. This particular reincarnation of the 129 travels indirectly from North Greenwich bus station to the Cutty Sark, making it one of the shortest bus routes in the capital. There are plans to extend the 129 to Peckham later this year, so this might finally become a more useful bus to catch. But, with the number 129 now plugged, London buses' lowest gap is at 135. What's the lowest number* not currently used by a London bus route? * Whole number, not fraction, because taking the 38¾ to Hackney would be silly. ** Positive, obviously, because taking the -38 to Hackney would be even sillier. *** Yes, I know I could have said "positive integer", but I thought I'd play safe. Today, under the watchful eye of international Olympic officials, construction of London's 2012 stadium commences. Blimey that was quick. Just ten months ago I was wandering around the Marshgate Lane industrial estate - watching the ducks, admiring the roses and peering into the window of the Mercedes repair shop. And now they've all been utterly swept away in a whirlwind of dumper trucks and diggers, and a global landmark building is about to be erected in their place. It's all kicking off weeks ahead of schedule, even before the 2008 Olympics have begun, following not-quite-one-year of Digging, Demolishing and Design. Sometimes, it seems, project management actually works. The transformation is astonishing. What used to be a hilly mound between braided rivers has been summarily flattened, and all that remains of the previous industrial landscape is a single tarmac road snaking across a plateau of barren earth. Raised embankments, a few metres high, mark the egg-shaped perimeter of what will one day be the stadium proper. Outside this proto-arena a brand new water feature has appeared, approximately the size of an Olympic-sized swimming pool but rather more irregularly-shaped and full of muddy liquid. I don't think this hole is part of the final plans, but it certainly looks a lot cheaper than Zaha Hadid's genuine Aquatics Centre planned for the opposite side of the river. Whatever, it is now possible to stand on the Greenway bridge and to imagine what might be about to appear. The great knockdown may be complete, but the grand build up will take considerably longer. There are now none-too-subtle hints that this area is evolving from a demolition zone into a building site. Two huge blocks of multi-storey portakabins await the imminent arrival of thousands of construction workers. 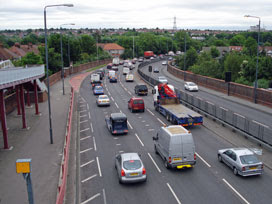 A big green footbridge crosses Marshgate Lane so that everyone can pass safely from one side to the other without being knocked down by a passing truck. Spiked yellow buoys block off all river access into the site, lest some cavalier boatman might sail in and compromise hard-earned security. 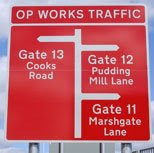 And outside, beyond the blue-walled perimeter, numerous newly-erected road signs prepare to direct heavily-laden lorries to one of 14 different entrance gates. The concrete is coming, and the world's athletes will only be 50 months behind.  Sixty Minutes: Rob has assembled a collection of sixty, one minute films (each a 360º panorama shot from a motorised tripod) shot in the area designated for Olympic redevelopment. It's now six months since St Pancras station reopened. 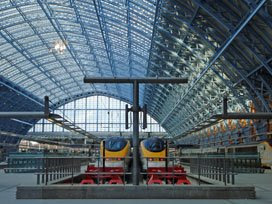 What a lot of publicity and bluster there was, most of it from Eurostar, rejoicing in the architectural splendour of the old Barlow Train Shed and revelling in the sheer decadence of a new luxury rail experience. But has the station lived up to the hype? Is this really "Europe's destination station", or is it just a lot of trains and a few shops selling sandwiches? I've been back to check. Good news for the marketeers. There are still people gawping at the giant Lovers statue and taking photographs of themselves next to Betjeman. There are even a few people sipping bubbly at the world's longest champagne bar, although from a distance they look like they're sat in a very thin wood-panelled burger restaurant. But that's upstairs, under the lovely roof. If the station's commercial heart is to survive, then the shopping experience downstairs really has to work. And it sort of does. Along the main arcade are all the sorts of retail outlet that a passing business traveller might desire. Greetings cards, knickers and flowers, obviously, plus dress shirts, fragrance and watches. There's a tiny Hamleys, in case you want to buy one of a handful of fluffy gifts for some distant offspring, and there's also a rather decent Foyles (where the best selling book, perhaps unsurprisingly, is a nine quid history of St Pancras station). Plus tons of places to eat and drink (or, more accurately, to sip and graze). There's almost nowhere to sit down otherwise, so the Paris-bound are irresistibly drawn to join artificial cafe society. But this is nowhere you'd go out of your way to visit at weekends. There's one main reason why central St Pancras is now buzzing. It's because there are an awful lot of people catching trains. The Underground arrives at the southern end of the station, while trains to Bedford, Leicester and beyond depart from the northern end. This means that thousands of commuters every day are forced to endure a forced daily route march past the Body Shop, Costa and Le Pain Quotidien. It's no wonder that some of them succumb and buy something. But one newly-opened corner of the station still echoes with the sound of inactivity. It's called the "Circle", and it's tucked out of the way near the not-yet-opened farmers market. You could easily pass through the station without ever realising that its shops existed, which is why a series of giant advertising boards have been liberally scattered throughout in a desperate attempt to attract custom. It's not really working. The only people I saw in Monsoon and Vodafone were bored sales assistants. The shelves at the front of the deceptively large M&S were stacked with lunchtime sarnies that nobody had bought. Piles of newspapers in Smiths looked doomed to be pulped at the end of the day. 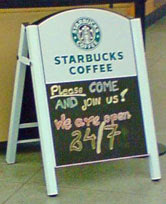 And the chalked sign in front of the out-of-the-way Starbucks read just a little bit too desperately. Please come and join us! Things will change when the tube station's new northern ticket hall opens in a couple of years time. Escalators will deposit passengers right in front of Starbucks' welcoming portal, and some might even notice the large Boots and Yo Sushi hidden behind. Until then the businesses represented in the Circle will probably wish they'd rented somewhere in a much more conspicuous location with significant footfall, far from this bypassed layby. St Pancras. It's not so much a "destination" as a retail walkthrough with a nice roof. But hey, still hugely lovelier than the grim desert nextdoor at King's Cross. ATTENTION CITIZENS: Do you show sufficient respect to our marvellous boys and girls in the Armed Forces? We at the Ministry of Defence don't reckon that you do. Which is why we've published a report proposing the introduction of a new bank holiday called British Armed Forces and Veterans Day, every June. Because respect is due. Or else. 06:00 Commemorative flypast by the Red Arrows. That'll rouse the lazy civvies who think a bank holiday is for laying in bed and going to IKEA. 07:00 Kit inspection: Sergeant Major Harris will be on hand to ensure that everyone in the village has shiny-buffed boots and perfect hospital corners. 08:55 Message of Support: Prime Minister Gordon Brown (tbc) speaks out via YouTube, and then Ross Kemp reads a stirring poem. 09:00 Homecoming Parade: Our Lads are back home after three months in a godforsaken foreign desert fighting some war that almost nobody in the UK understands. Come and watch them march up and down a bit. 10:00 Meet The Regiment: Find your Army soulmates, either in the West Henley ToffGenerals or the East Thurrock CannonFodders. 10:30 Wild Applause: Don't forget to burst into spontaneous appreciative clapping every time you see a man in camouflage gear. Oh rah rah that man. 11:00 Not the Two Minute Silence: Oi, you lot, stop gathering by the war memorial! Today is about remembering our glorious Armed Forces and Veterans, not commemorating the dead. They get a day to themselves in November. Now get back to the parade ground and start cheering. 12:00 Another Flypast: It's some old Spitfire and a couple of Chinooks this time. Honestly, it's noisier than living under the Heathrow flightpath. 12:15 The Flotilla of National Pride: The Royal Navy, who've been feeling pretty excluded so far, push a few paper boats across the duckpond. 13:30 Vocational Learning Demonstration: Teach yourself some useful army skills, like tank-driving, battle logistics and bayonetting. 14:00 'Freedom' Parade: Because if we brand the Armed Forces properly, somehow all that killing doesn't sound quite so bad. 14:45 Press Gang: Royal Navy Recruitment Officers kidnap a few lanky-looking adolescent yobs from the bus shelter on the edge of the village green and cart them off to live out the rest of their lives in a submarine. 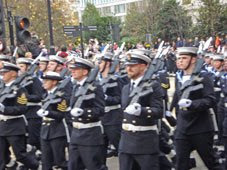 15:00 Military Tattoo: Anybody fancy "I ♥ Our Brave Boys" needled into their forearm? 16:00 I Fought In The War You Know: The Vicar awards tiny gold-plated medals to all the local WW2 veterans that society has shamelessly ignored for the last 60-odd years. 16:30 Teenage indoctrination: Members of the newly formed Little Dumley Combined Cadet Force stand around in ill-fitting uniforms, fondling rifles and making their mothers terribly proud. 17:00 The Great Military Quiz: Schoolmistress Miss Humphries tests Class 3B on all the famous battles they've been learning about in Citizenship lessons this term. 17:45 Rounding Up of the Conscientious Objectors: Join the vigilante squad in the High Street so that the disrespectful can be named and shamed in tomorrow's Sun. 18:30 The Goat Race: Regimental mascots compete for a shiny silver cup. 19:00 Billycan Bonfire: Come share some rations out of a warm squeezy tube. 20:00 The Royal Tournament: Ah, remember the golden days when our TV schedules were cleared once a year so that the BBC could screen bagpiping bandsmen, formation horse-trotting and that pointless contest where two teams dragged a cannon across an obstacle course without touching the ground? Well it's back, and you will not switch over to ITV. 22:30 The Last Post: Little Dumley's residents bubble with crusading pride. And then straight to bed, because it's back to work in Civvy Street in the morning. For one weekend every month, from roof to basement, the giant glass goldfish bowl at City Hall is opened up to the viewing public. 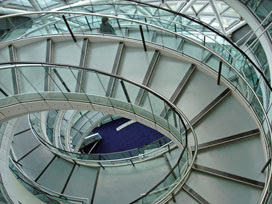 Negotiate the knife-detecting security arch at reception and you too can check out the seat of London democracy. See the lovely view from the roof. See the offices where your taxes are spent. And see the debating chamber where our capital's elected representatives attempt to run things whilst simultaneously shunning that new BNP oik. I couldn't resist a trip to the very heart of Project Boris, just in case there were any clues inside regarding what he's up to. But there weren't. It's still a bit early in the Mayoralty, and he doesn't seem to work weekends. First stop, the roof. The public lifts allow access only to the second floor and below, plus a single illuminated button for the ninth floor. Up top you'll be welcomed by smiling City Hall employees (presumably on overtime) and directed out into a tedious entertaining space called London's Living Room. Forget that, and head out onto the balcony. There's a great view of Tower Bridge from up here, as well as a direct line of sight across the Thames to the Tower of London. Close by is the cluster of City skyscrapers of which Ken was so fond (time will tell if Boris is quite so keen) with the pointy Gherkin at its heart. Further out, look, Canary Wharf, and Shooter's Hill, and the whole glorious panorama of southeast London. It used to be possible to see southwest London too, but then some property developers erected the shiny glass blocks of More London and now all you can see is posh offices and a concrete plaza . Ah well, it's still a damned good free view all the same. To get back down, you take the stairs. But these are no ordinary stairs, they form a precipitous swirly spiral that slowly descends inside an open cavern at the front of the building. Small loops at first, then increasingly wider and broader as they cascade earthward. Looking down , or up , there's always a photogenic backdrop. And there's also a unique opportunity to peer through the surrounding glass into six consecutive floors of GLA offices. No sign of Boris's lair, but plenty of hole punches, highlighters and stacked-up boxfiles. On one desk a half-eaten box of Cheerios, on another a pink squishy pig and an invite to a champagne reception at Kew Gardens. Oh, and if the IT department are reading, there's a red flashing light on printer 4250PCL on the third floor. Oh yes, this is certainly open democracy. At the foot of the stairs is the main debating chamber. I think the royal blue carpet has been there since Day 1 and isn't a recent Boris initiative. Make sure you time your visit to avoid Sunday lunchtime, otherwise this section might be closed off to allow the filming of some BBC Politics programme that nigh nobody watches. Take a look at the latest designs that may one day fill Trafalgar Square's fourth plinth - there'll be a chance to vote for your favorite later. And on, down to the ground floor, around yet another spiral ramp . 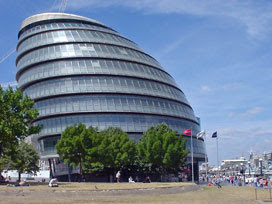 Norman Foster's City Hall building is an especially curvy building, and sometimes it feels as if he could have crammed in a whole lot more offices if only half the building wasn't spiral ramps. And finally, don't forget to pay a visit to the Visitor Centre on the lower ground floor. The centrepiece is a massive photomat depicting an aerial view of the whole of Greater London. It's incredibly detailed and up to date (this version was reinstalled only last month). Come hunt for your house, and your place of work, and ooh look that's Wembley Stadium, and blimey isn't Bromley green? Plonked on top of the map at present is a temporary installation entitled Greenhouse Britain (sorry if you live in Docklands or Dagenham, you're currently obscured). This is a very Ken exhibition, all global warming and sustainable living, and one wonders whether Boris will want to fork out taxpayers money on similar stuff in the future. Or even want to waste cash on opening up City Hall for one weekend every month. I hope so. But if not, come soon. It being a year divisible by 4, curators at the Victoria and Albert Museum have been busy assembling an appropriately Olympic exhibition. They've gathered together a comprehensive collection of Olympic posters, from Paris 1900 right up to London 2012, and all are now on show at the Museum of Childhood in Bethnal Green. Not a very thrilling concept you might think - there's only so much you can do with five rings and a few sportsmen - but it's actually a fascinating way to view the evolution of global 20th century design. See how the artists of the day tackled the Olympic brand brief, from proud torchbearing patriotism to abstract symbolic ingenuity. And yes, all leading up to that design at the end. This is a rather larger exhibition than I was expecting, filling at least half of an upper gallery. I'm not quite sure why it's being hosted at the Museum of Childhood - the theme certainly falls well outside their usual pre-adolescent focus. But very young children seemed to be enjoying the exhibition all the same, providing them with a fantastic space in which to run around and chase one another. Most of the genuine visitors appeared to be twenty- or thirty-something male meeja types, here to update their creative portfolio, and absolutely none of them with children. The first Olympics are represented here by their programme covers, as it wasn't until Stockholm 1912 that an official poster was published. Early Olympic posters often had a very strong nationalistic theme, with artists depicting proud rippling athletes in front of recognisable landmarks. Berlin 1936 for example, with laurel-crowned victor towering above the Brandenburg Gate, or London 1948 (Big Ben plus discus-hurler plus rings - sorted). In the 1960s, however, things started to change. Tokyo 1964 ditched sport in favour of a big bold rising sun, and Mexico 1968 went all op-art with eye-popping concentric black lines. It's this dazzling Mexican design that still stands out as the most modern anywhere in the collection, and the one that'll probably sell the most postcards in the shop downstairs afterwards. On into the modern day. Soft abstract designs dominate, with cunning logos (like Barcelona 1992 or Sydney 2000) where a handful of brushstrokes represent leaping athletes. Photography has been used only infrequently - Nagano 1998, with a thrush sitting on two ski poles, is a rare exception. And then, yes, all the way up to date with London 2012. The Back The Bid posters, with athletes vaulting over major landmarks, still retain a forceful impact. And then there's Lisa Simpson. We haven't had an official London 2012 poster yet, so the organisers have merely spraypainted a large angular blue logo straight onto the wall. 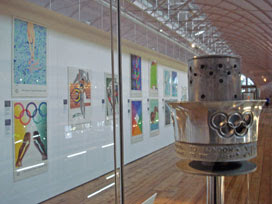 According to the art critique label alongside "The London 2012 brand was launched on 4 Jun 2007, when the emblem was first revealed, exciting an extraordinary public reaction". I'll say. Seen here in context it's very much the odd one out, but it certainly upholds the Olympic tradition of cutting-edge design. What's needed in this space is an electronic poster, not yet published, representing the irreversible shift to dynamic multimedia. 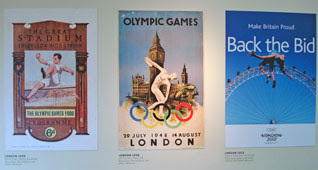 But that's for the next exhibition - Two Centuries of Olympic Posters. The children running around the gallery today may well enjoy that.